Included as part of the Influenster Love Vox Box that I was so fortunate to receive this month was a package of Truvia. My first question was: Is it pronounced TRU-via, or tru-VIA? Answer: It’s tru-VIA. 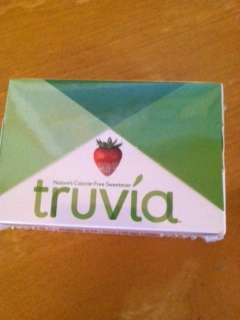 Truvia is a totally natural sweetener made from the stevia plant. Now, I planted a stevia plant in my herb garden last summer and can attest to the fact that it’s SWEET. One tiny bite of a leaf was almost unbearable. If one were to just use this as a sugar substitute the amount needed would be miniscule. So Truvia uses a substance called erythritol to add some bulk. Also a natural product, erythritol is a fermented sugar alcohol. Those two ingredients, plus some trace, unnamed natural flavors make up Truvia. I’m not a coffee drinker, so I’m not in the habit of using a sweetener on a daily basis. I do, however, have a spot of tea now and again. I tested a packet in a mug of herbal tea and almost couldn’t drink it. WAY too much! Turns out, for me, all that was needed was about 1/3 of a packet. Good value, and no calories. A 40 packet box of Truvia retails for about $3.99. At the rate I use it, one box should last me a good long time. It also comes in a recloseable jar to spoon out just what you need. At this time, Truvia is on the verge of releasing their newest product; Truvia Baking Blend. Used at a ratio of 1/2 cup for 1 cup of sugar it could substantially change the calorie content of all those yummy baked goods we usually have to steer clear of. Super tiny, easy to transport. I’ll be bringing these packets with me when I travel so I’m not subject to the usual array of artificial sweeteners far from home. Stevia sugar is a lot better than artificial sweeteners. Artificial sweeteners are very harmful on your body to begin with. If you’re on a diet, or trying to lose weight, Stevia is the best alternative! Awesome post!